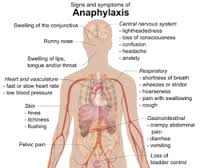 Anaphylaxis is a systemic serious allergic reaction that can be life threatening if the appropriate medical treatment is not carried out. Anaphylaxis occurs after a person is exposed to a substance, like peanuts, and becomes sensitized to it. The next time that the person comes into contact with that substance an allergic reaction occurs. The body releases histamine and other inflammatory mediators that cause the airways to swell and can affect the entire body, thus causing an Anaphylactic reaction. Anaphylaxis can occur in response to almost any foreign substance. Common triggers include venom from insect bites or stings, foods, and medication. Other substances that can cause anaphylaxis include: food additives, hormonal changes, and latex, but these are less common. People with asthma, eczema, and allergic rhinitis are more likely to have anaphylaxis than other people without these conditions. Certain people are at increased risk of anaphylaxis. People that have allergies, asthma, and a family history of anaphylaxis, are all at increased risk. Additionally, a person who has had a previous episode of anaphylaxis is at increased risk. Swollen throat or swollen areas of the body particularly the eyes, lips, and face. There is not a specific test that is used to diagnose an anaphylactic reaction as the diagnosis is based on physical presentation. However, a person’s risk to develop anaphylaxis can be assessed by an allergist/immunologist who can carry out tests including blood work and skin allergy testing. 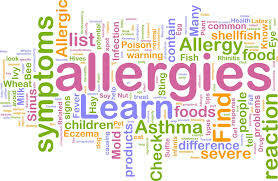 The provider will also ask for specific details regarding all past allergic reactions that include any of the symptoms in the previous section. The mainstay of treatment for anaphylaxis is epinephrine. All patients at risk for anaphylaxis should carry and autoinjectable form of epinephrine. This is a single dose of medication that is injected into the thigh when a person begins to experience the symptoms of anaphylaxis. It is vital that the patient and patient’s friends and family members know how to use the autoinjector. Additionally, the patient should carry the autoinjector at ALL times. If a patient feels that they are having an anaphylactic reaction they should use the autoinjector and call 911 immediately. Patients should also have an anaphylaxis action plan on file at work or school so that others can recognize symptoms and provide treatment if necessary. Medical alert bracelets or jewelry are also helpful to identify specific allergies. The best way to prevent future attacks is to avoid allergens that trigger allergic reactions and seek treatment with an allergist for these allergies.